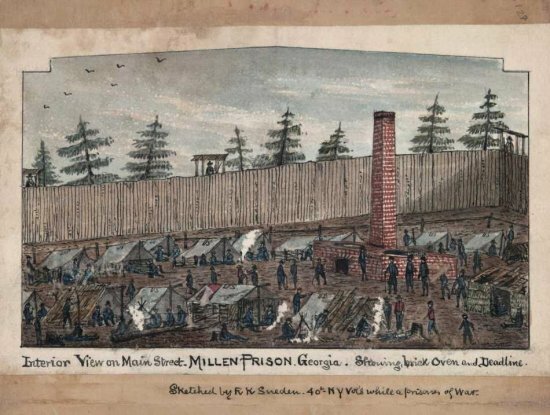 In 1864, just a few weeks before Sherman overwhelmed Confederate defenses in Georgia, Confederate authorities built a small prison camp in Millen, Georgia, to house some of the prisoners from the vastly overpopulated Andersonville prison nearby. It only lasted 6 weeks, but in that time Camp Lawton grew to hold 10,000 Union prisoners of war. When Sherman got there, all the inmates and guards had gone, hastily evacuated in the middle of the night. He burned the stockade and soon a lovely pine forest grew in the spot. Since the prison had been so short-lived and so small compared to ignominy hound Andersonville, nobody bothered to mark it for historical purposes. Archaeologists looked around for the stockade markers every once in a while, but beyond that there really wasn’t much interest in pinning down the camp site. This year Georgia Southern anthropology professor Dr. Sue Moore and graduate student Kevin Chapman were finally able to pin down the location of the stockade using Civil War-era documents and ground-penetrating radar. Much to their and everyone else’s amazement, they also found a huge wealth of artifacts, some of them unique. Chapman expected to find some post holes. But during his first day of sifting dirt, he found a Union button, then a musket ball, then a large U.S. cent, the size of a half-dollar. “The results have been stunning,” he said. Chapman said the stockade and other occupied structures comprise less than 10 percent of the 42-acre camp. Of that stockade area, only 1 percent has been studied, he said. 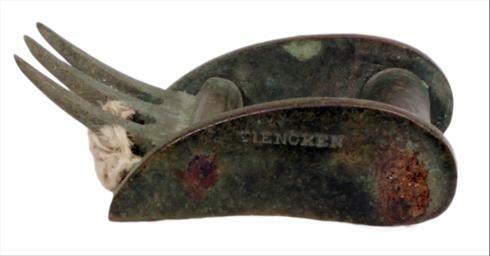 Among the artifacts unearthed is an improvised tobacco pipe, with a bowl made from melted lead bullets and a 3-inch clay stem that bears the teeth-marks of the prisoner who used it. The hasty dead-of-night departure ensured that prisoners left their treasured possessions behind: eating utensils, empty picture frames, even a scary looking tourniquet buckle. The lack of interest from locals and the property’s later status as a government hatchery ensured that those treasures remained untouched for the Georgia Southern team to find. They even kept the find secret until just now to give them time to secure the site from looters and Civil War aficionados. The government plans to reopen the hatchery, but it won’t interfere with the Civil War portion of the property. That will be fenced off and kept safe for archaeological study. The artifacts have been temporarily put on display at Magnolia Springs State Park. Later they will become part of the permanent collection of the Georgia Southern museum in Statesboro.